Perhaps you dabble in dog breeding on the side and wish to create a site where you can list the puppies you currently have available? Or maybe you have found that many local breeders cannot find a site where they can specifically post the dogs and puppies they have for sale? 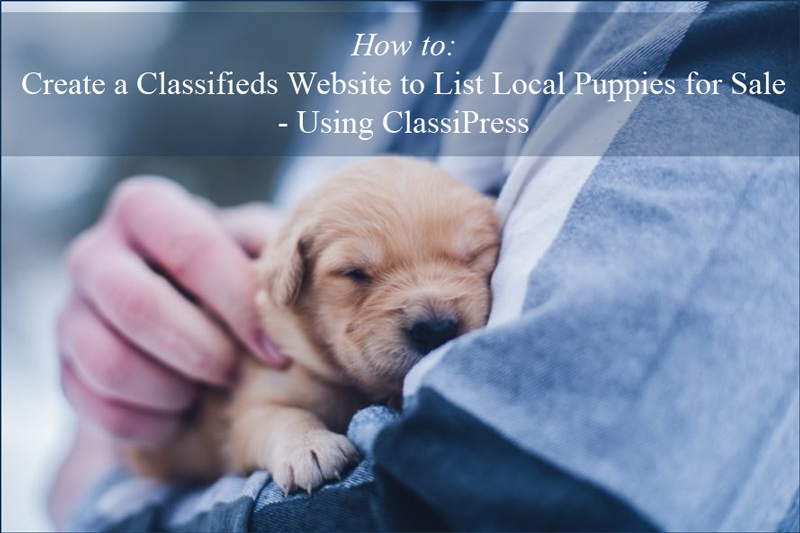 If you plan on creating a WordPress classifieds website either to list your own puppies for sale or create a place where other locals can do so, why not use the ClassiPress AppTheme? ClassiPress is a powerful WordPress theme that includes functions required to create a classifieds website. This AppTheme allows you to edit and design your very own classifieds website in under an hour. Not only does a ClassiPress website look professional, but it also includes all the necessary features to begin listing your own ads, and collect revenue through visitors listing their ads. Whether you intend to make revenue through selling prime advertising spots to other dog breeders, you intend on making money by selling your own dogs or you wish to make money from using a third party advertising agency such as Adsense, the options are endless when you use ClassiPress. Why Should I Create a Niche Classifieds Website? Before we go ahead and discuss why a niche classifieds website is a better approach, it is important to understand what a Classifieds website is, and the purpose of a classifieds site. A classifieds site is designed to be a place where sellers can list items they have for sale and then potential buyers can find items for sale by location or category. Classified ads are not only found on websites, but also appear in newspapers and magazines. The purpose of a classifieds section is to connect sellers to buyers and buyers to sellers. With that in mind, why is a niche classifieds site a better approach? While a large and broad classifieds site has worked in the past for some big brand websites such as ‘Craig’s List’, your chances of outranking these websites is little to none. Creating a niche classifieds site, for example a place where puppies and dog accessories can be listed and sold, allows you to dedicate the entire site to ‘dogs’. This means that the home page and blog can both be dedicated to the niche of your choosing. A visitor to your website then automatically knows they will be able to not only be able to find their forever friend, but also any accessories they’ll need as well. Creating a niche website that you then target a specific area with, strengthens the chance of you ranking for certain local key words. For example, you may create a website specifically for puppies and dogs for sale within the Sydney region. Creating a niche website increases the chance of being seen by those who may actually want to list dogs they breed. Unlike clothing, generally the cost of transporting an animal is expensive and sometimes thought to be cruel. This is why a local website where local breeders and buyers can connect makes the most sense. How Can I Create a Dog Classifieds Website? Before you go ahead and download the ClassiPress AppTheme, you’ll need to ensure you have registered a domain name, such as ‘localpuppies.com’ or a more specific ‘.com.au’ if you are living within Australian. Once you have set up WordPress, registered for a domain and acquired hosting, you’ll be ready to set up you classifieds website. From your WordPress dashboard, Install and Activate the ClassiPress AppTheme. Once ClassiPress is activated on your WordPress site, you’ll be ready to complete the basic configuration and then customize the base theme to better suit your niche website. Complete the basic configuration for ClassiPress by watching some of the ClassiPress Video Tutorials. Once you have completed the settings you’ll be ready to customize your theme to better suit your site. From your WordPress dashboard, click on the ‘Appearance’ menu and then on ‘Customize’. This will take you to the appearance customizer where you can change; the site title, site tagline, website colors, background image, layout, menus and widgets. Use the customizer tools to make the website, look and feel like a dog lovers classifieds site. Ensure you ‘Publish’ the changes you have made. Click on the ‘Pages‘ menu in your WordPress Dashboard. Locate the page titled ‘Search for…’. It is on this page you can change the main header image by removing the ‘Featured Image’ and then uploading one that suits the website. For example, we have used a photo of a puppy dog as our header image. Edit the text on the ‘Search for…’ page so that it reads search for and then the options someone could search on your website. For example, our site reads ‘Search for’ followed by a list of dog breeds. You will need to decide if you will categorize the dogs by breed, age or coat type. Now we will need to add categories in which the visitors can list their ad underneath. 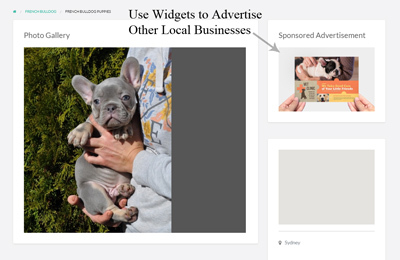 Click on the ‘Ads’ menu from your WordPress dashboard. Click on ‘Categories’ and then it is here you can add categories that potential visitors can list their dog ads under. The categories may be generic such as ‘Puppy’ or ‘Dog’ or more specific to the breed such as ‘French Bulldog’ or ‘Labrador’. You may even like to include some categories when your visitors can advertise dog accessories. Customize the form your visitors will need to fill out to list their animal from the ‘Custom Fields’ menu found under ‘Ads’ in your WordPress dashboard. Ensure that the form is generic and will be the right fit for any dog related advertisement. You have now successfully set up the basics for your Dog and Puppy Classifieds website. 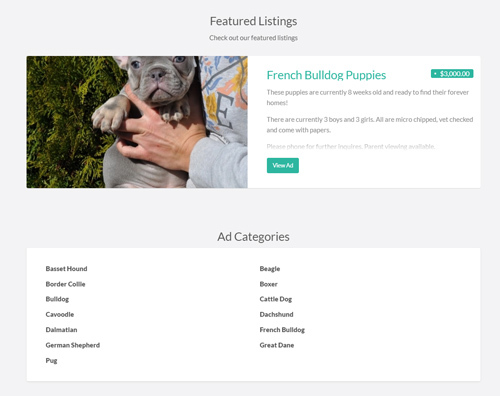 Your visitors will now be able to begin to list the dogs they have for sale. To populate your website to get natural traffic, it is a good idea to find some local dog advertisements and add them free of charge. Another robust feature of ClassiPress is the Blog. The blog allows you to add content to your website that relates to your Classified ads. This can help to rank you in Google for certain key words. A blog post can be added by simple ‘Publishing’ out a ‘Post’. Each published post will appear as a new blog entry. Below we created a simple blog entry title ‘Why Should I Buy a Dog Carry Case?‘. In this blog post we’ll link to some of our own carry case advertisements from the dog accessories category. How Can a Dog Advertisement be Listed on my ClassiPress Website? Advertisements can be listed on your classifieds website from the front end by a visitor clicking on the ‘Post an Ad’ button, or by admin creating an advertisements from the WordPress Dashboard. It is a good idea to run through the process in which the visitor would need to take when attempting to list an ad to ensure the process is smooth and easy. You do not want a visitor leaving an advertisement unfinished because the process was difficult or displayed errors. Click on the ‘Ads’ menu and then on ‘Add New’. This will take you to the ‘Create New Ad’ page where you will need to fill out a number of fields that relate to the advertisement. Adding multiple images to an advertisement can increase the chance of a visitor clicking on the ad to view more. You will need to place your add into one or multiple ‘Categories’. This is where your advertisement will appear on the front end of your website. Once you have completed the ad, click the ‘Publish’ button. Click on the ‘Post an Ad’ button. Choose a ‘Category’ in which your ad will be placed under. Fill in the ‘Fields’ that relate to the listing. ‘Preview’ and then ‘Post the Advertisement’. If you as admin have chose to make the ad ‘Sticky’ then it will appear under the featured listings section on the homepage. How Can I Benefit from Having a Local Classifieds Dog Website? There are a number of ways an administrator can benefit from a ClassiPress classifieds website. If the administrator breeds dogs that they then sell to the public, a classifieds website is a great way to market the new dogs to local pet lovers. They can then direct a social media following to the website, or advertise their website at local dog clubs or newspapers. If the administrator has a love for dogs and puppies although is not a breeder, the classifieds website will allow them to earn an income by selling ad spots to other local breeders. ‘Ad Packs‘ and ‘Membership Packs‘ can be created by the admin to then sell to those breeders who will be posting new puppies or accessories regularly. A high traffic website generally will charge more for breeder to list their advertisement. It is a good idea to begin at a base advertisement price and then only increase if you see the traffic of your site has spiked. If many visitors are coming to your classifieds website to see the dogs, puppies and accessories that are available locally, you may be ready to use Google Adsense or advertise for other local business on your website. This gives you another source of revenue.